I would like to thank you for all your support and wonderful comments during my first months of blogging! It had been such a pleasure meeting you all and I'm looking forward to "seeing" you again next year! 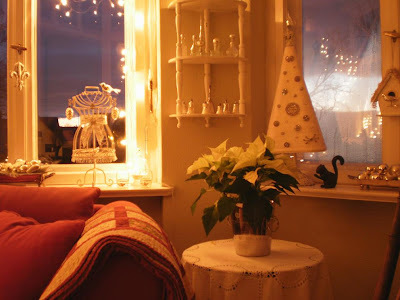 It took me pretty long this year to get my Christmas decoration done but I'm finally finished and now I would like to invite you to take a look into our living room. 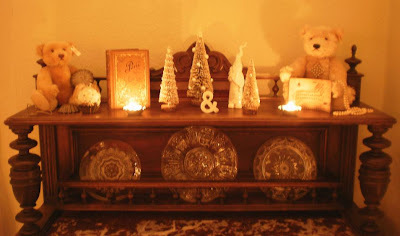 The small rack you see below had been a flea market find that I painted white. 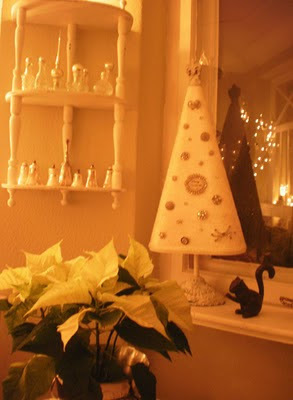 The styrofoam tree we had once bought in the US and had carried it in our hand baggage. The customs let us unpack that thing. It must have looked like one of those dangerous styrofoam weapons, LOL. No, well I can understand since it has a very long and thick metal screw. It had a gold colored base and tip and was covered with red velvet. For the last years it had been decorated with my vintage Czech rhinestone Christmas tree brooches. Because of my new color scheme the tree had to undergo a change this year. So I painted it white, did a little bit distressing and sewed a cream colored velvet cover. Then I pinned rhinestone buttons, brooches and a belt to it. See the little cast iron squirrel? It's a nutcracker and I love this little guy. 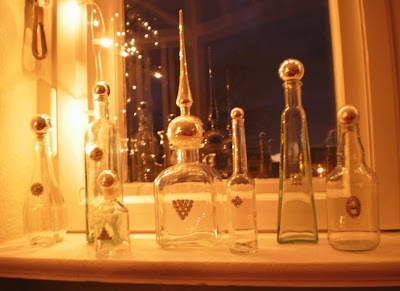 In the French magazine "Marie Claire Idée" I had seen a picture where they used glass ornaments as bottle closures. 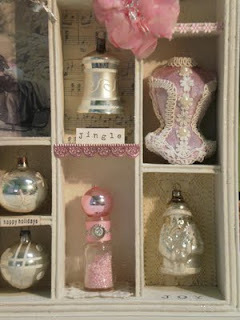 I loved the idea as you can see but I found the bottles would need some more decoration and so I glued rhinestone brooches and buttons on. I love faux pearl necklaces for decoration and can hardly resist when I see one at the flea market for a reasonable price. 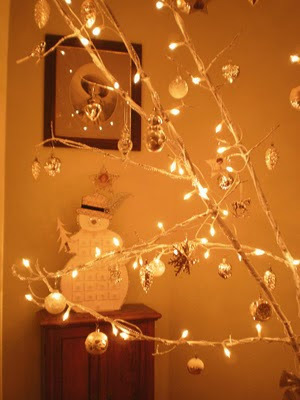 To stay with my white, creme and silver theme I decided not to get a fir tree but to paint a large branch white and use that as our Christmas tree. The garden table below had been a curbside find, deposited there to be picked up by the garbage collection. For me it had just the perfect vintage look. 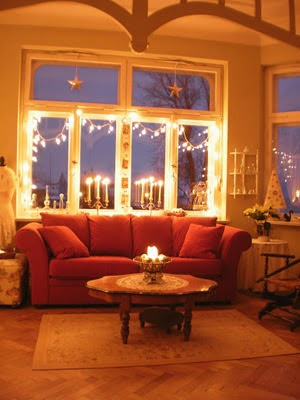 Karen over at My Desert Cottage had shown beautiful pictures of her home. 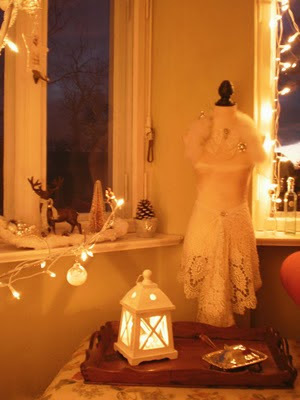 Her sweet mantle decoration inspired me to take 2 teddy bears from my studio into the living room and place them onto the cupboard. Thank you, Karen for this wonderful inspiration! Thanks for your visit, dear friends! Hopefully you enjoyed the tour a little bit. 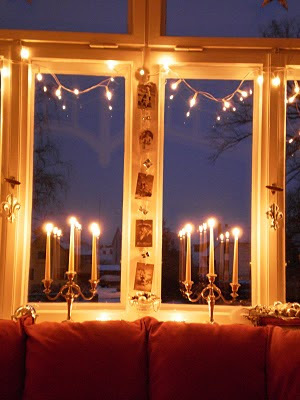 Have a wonderful weekend and don't get stressed out too much by the Christmas preparations! 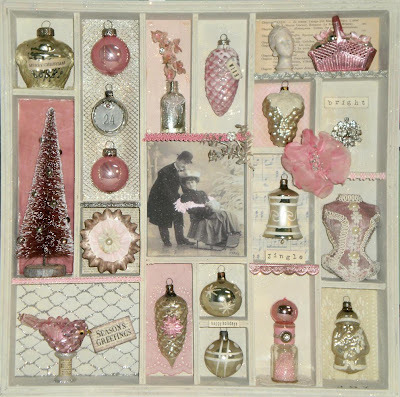 Even though the Christmas colors in our living room have changed a few times over the last years, I always stayed with pink in the hall. While working on my first type tray I already knew that I would make one for Christmas too. 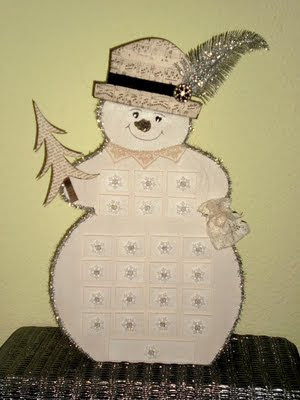 This one should hang in the hall and therefore I decorated it with pink, silver and cream ornaments and embellishments. You won't believe that bottle brush trees are hard to find in Germany. I was so very lucky when I spotted them in a small department store. They only came in green and a yellowish golden tone, so I bleached one and used easter egg dye to get the desired color. 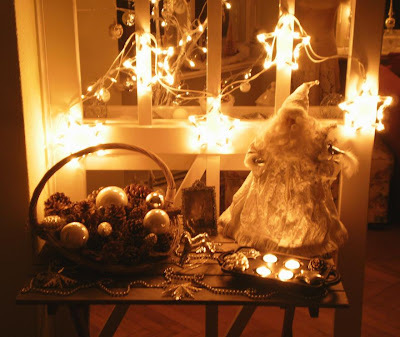 I had all kinds of new and vintage Christmas baubles and ornaments that had just the right size to fit in the departments. 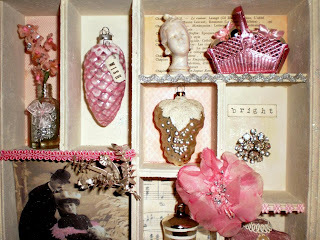 Although pink is the favorite of my favorite colors, I couldn't come up with enough matching embellishments. 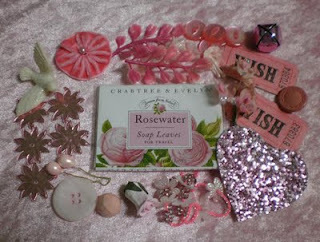 Dear Carola over at Boxwood Cottage was so sweet to check her stash and sent me a bag of pink goodies. Besides the cute yo-yo you can see in the picture above, I also used the large flower and the small ones, the Dresden foil basket as well as the foil border and foil flower. 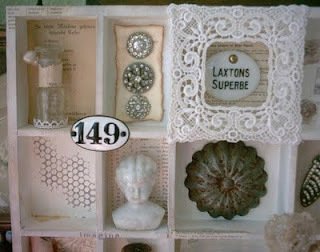 I love everything she had sent and I'm sure I will use the remaining lovely goodies in upcoming projects. Thank you so much, dear Carola!!! 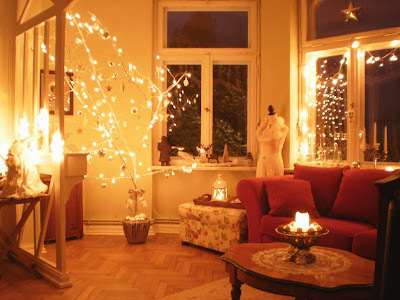 Please hop over to Carola to see her and her mum's beautifully decorated homes! I'm off now to work on some Christmas gifts ... Have a wonderful day! DH knows me very well and always watches out for embellishments I could use in my art or items I could alter. When we go to a flea market we usually seperate after a few minutes because he is through with looking much faster than me. 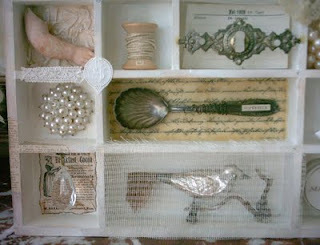 Since I like to check out every box of laces, photographs and knickknack I need a lot more time. DH is a real sweetheart and waits patiently in the car reading a magazine or a newspaper. 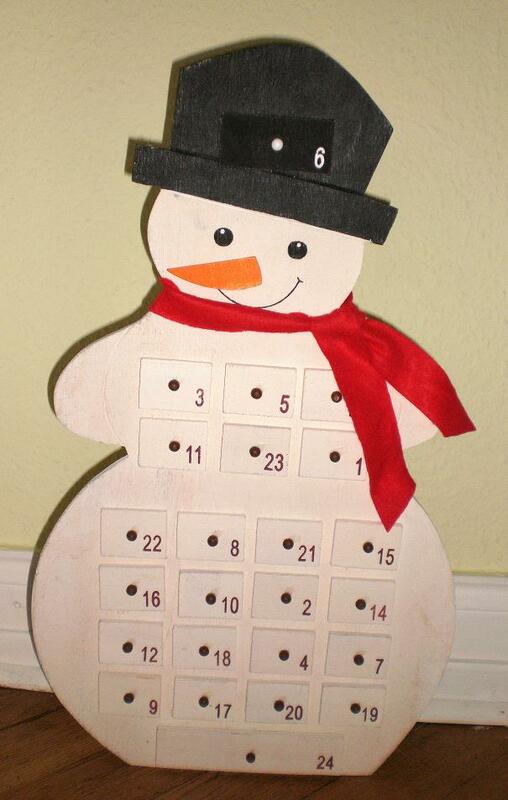 When I come back he often has a little gift for me and some weeks ago he surprised me with a snowman advent calendar to alter. 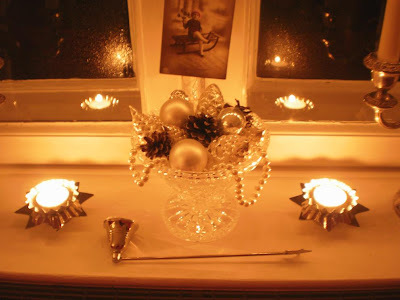 After having the traditional Christmas colors red, green and gold for some years and red and white for the last two years, I decided to go for white, cream and silver in the living room this year. The snowman should get a matching makeover. 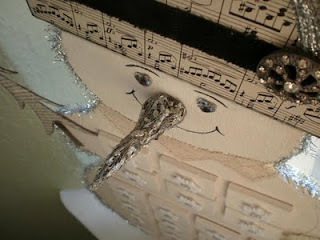 I took off his nose and the wooden knobs of the little drawers and painted him. Well, then I changed his gender and the snowman became a snowgirl ... 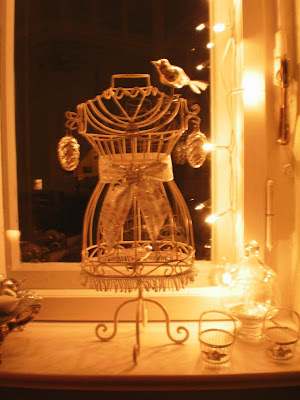 Sorry, dear snowman but girls just can be dressed up more fancy! 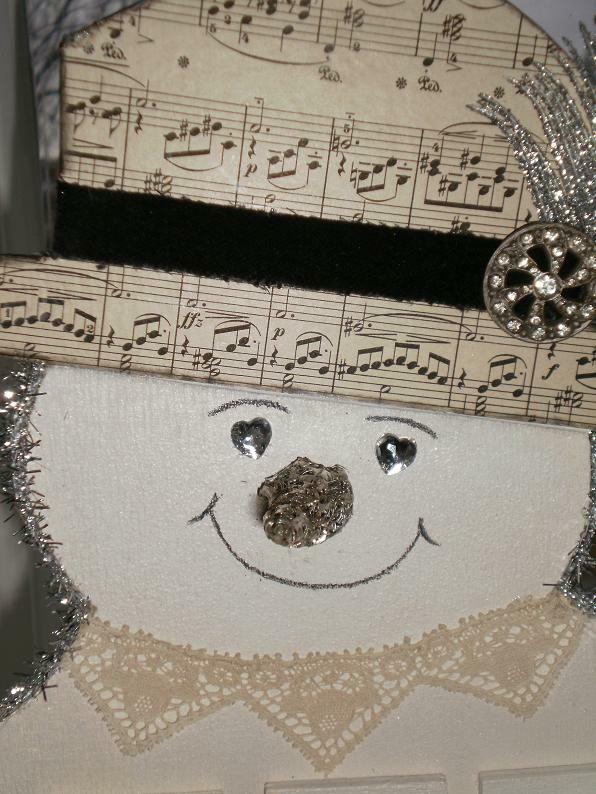 I glued sheet music onto the hat and added a velvet ribbon, a feather and a rhinestone button. Instead of a scarf I gave her a lace collar to wear around her neck. 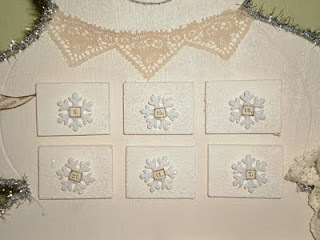 From a vintage book I cut out the required numbers and adhered them onto the snowflakes which I attached to the drawers. The original nose was a flat piece of wood and I didn't want to use that. I checked out my stash for anything that would make a nice nose but couldn't come up with anything that would look like one. A while ago I had bought a package of silver angel hair which I didn't like very much because it was stiff and not shiny. I played around with it and formed a nose shape. It didn't look so bad but it still wasn't the perfect nose. When DH came into my studio to see what I had been up to, I asked him if he would have any idea. He looked at the angel hair nose and said "Why don't you just solder it a little bit?". That's what I did and I love the result. 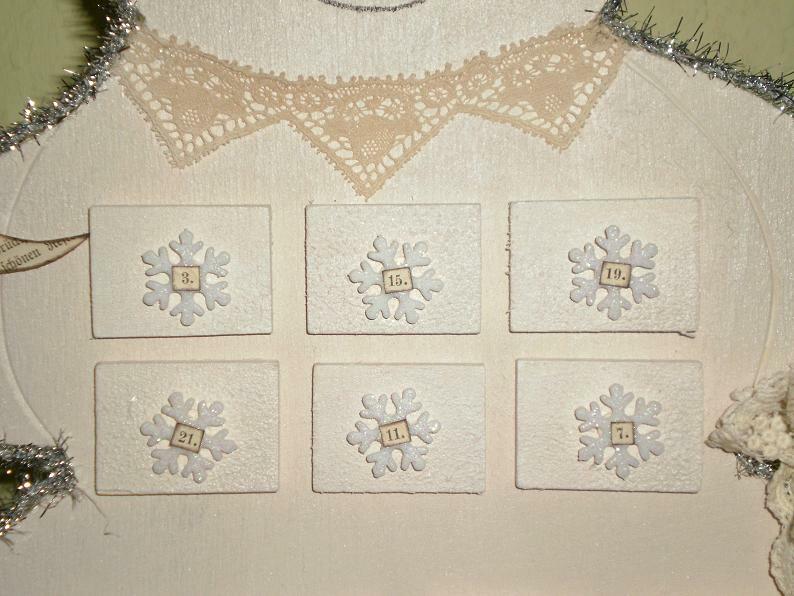 When you are wondering what happened to drawer number 6 (the one in the hat), I replaced it with the lace pouch because snowgirl liked that better. 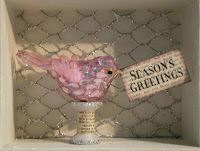 I have been working on a couple more Christmas projects and will show them to you soon. 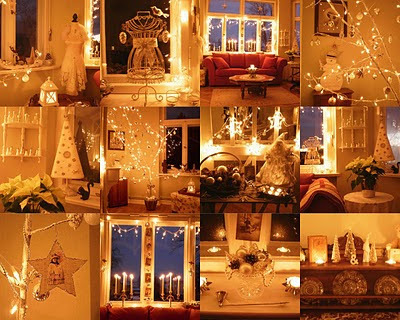 Till then I wish you a lot of fun with your Christmas decoration! dear friends and have a lot of spooky fun tomorrow! I am a member of the wonderful yahoogroup "The Latest Trends in Mixed Media Arts". There is always something going on, like swaps or workshops. 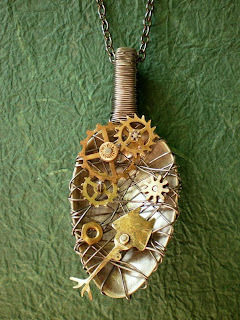 This month Lynn Stevens has held a workshop how to alter spoons into fabulous pendants. I was looking forward to that a lot but had been a little bit afraid of working with a torch. Lynn assured me that I would do fine and she was absolutely right. It worked very well and now I am confident to use the torch for other projects, too. 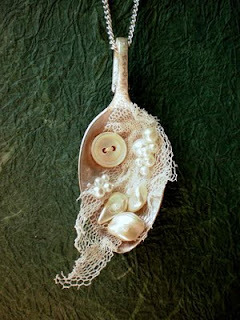 Decorating the spoons was a lot of fun and I came up with 3 different kinds of embellishments. 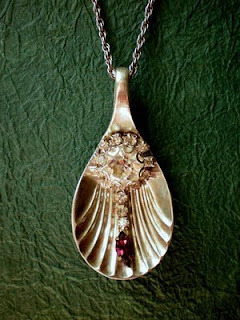 I am sure that I will make some more spoon pendants soon. 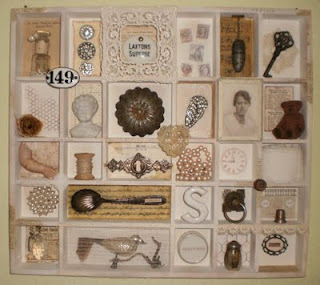 In a recent issue of "Somerset Studio", there had been published a type tray, beautifully altered and decorated by Lynne Perrella. I immediately fell in love with the idea and the colors she had used. The following Sunday I watched out for a type tray at the flea market and I was lucky to find one. Back home I painted it with gesso and added Distess Ink and some melted bees wax in some areas. 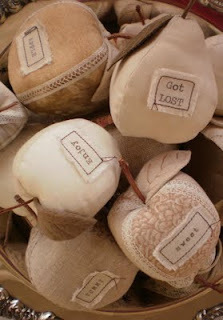 I glued a couple of laces and some vintage text on and stamped a little bit here and there. I knew that I wanted to use an original photo I had bought a while ago. On the back it says that her name was Anna. I put that picture into a frame and adhered it to the tray. 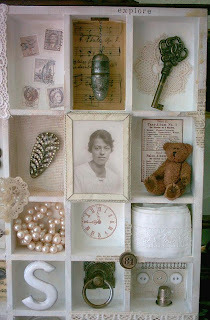 Then I added all kinds of vintage finds that could have had a special meaning to Anna, at least in my imagination. I didn't want everything to stand upright in there and so some items are glued to the background or hang from above. 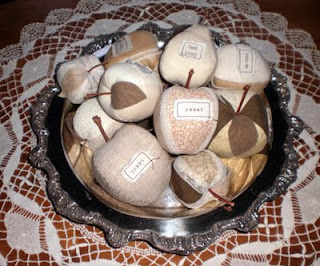 I had been a little bit in a sewing mood lately and so I made a bowl full of apples. 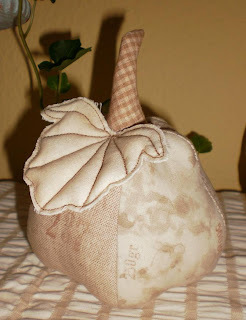 Although the pear claims that it got lost, I think it just needed a change from its normal companions and so it chose to stay with the apples ;-). 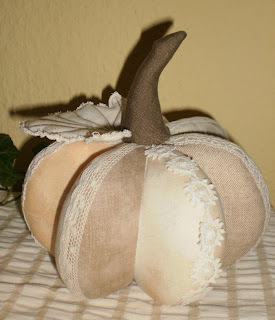 Since orange is just not my color, I was very happy when I found some cream colored pumpkins at last Sunday's fleamarket for my fall decoration. I put them into my favorite bowl together with some vintage finds and a couple of roses that I had made from an old sewing pattern. 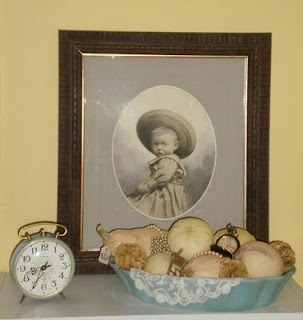 The alarm clock perfectly matched the bowl color and the lovely picture which had been my favorite find of the week before, made a wonderful addition. The weather had been very pleasant on Sunday and so we had a wonderful time at the fleamarket. 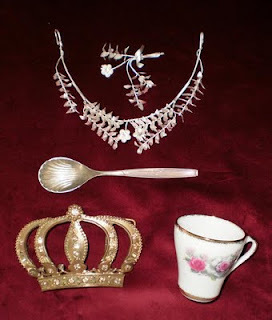 I found a crown which had been a belt buckle once, a lovely cup, that nicely shaped spoon and a silver wedding headdress with matching pin. 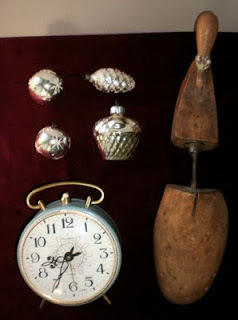 The vintage Christmas ornaments also had to come home with me, as well as the shoe tree and the alarm clock. 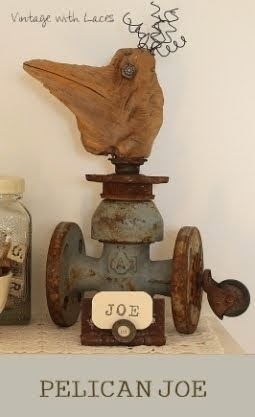 Normally I would take the clock apart to use the body as a frame or for an assemblage and the parts as embellishments, but this one will stay "alive" because of its wonderful turquoise shabby color and the lovely clock face. DH found this beautiful coat rack. It is totally rusted and needs some steel brush treatment before I can start painting it. 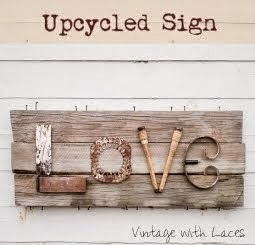 Instead of replacing the mirror that had been in the oval once, I think I will create something onto a piece of wood that will add to the romantic look of the piece.